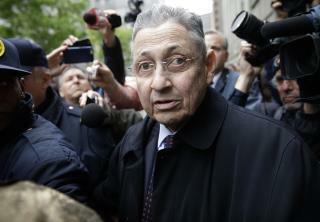 (Newser) – The corruption conviction of former New York Assembly Speaker Sheldon Silver was overturned Thursday by a federal appeals court that cited a recent Supreme Court ruling that narrowed the definition of what it takes to convict a public official. The three-judge panel of the 2nd US Circuit Court of Appeals in Manhattan said it couldn't conclude that a rational jury would have convicted the Democrat if it had been properly instructed on what constitutes an "official act." Silver was sentenced last year to 12 years in prison after he was convicted of collecting $4 million in kickbacks from a cancer researcher and real estate developers in return for using his powerful post to help them. He hasn't had to report to prison while he awaited the outcome of his appeal, the AP reports. Wow. When you're a New York Jew you can get away with anything. How long does the Department of Injustice think American citizens will watch these gross acts of injustice and corruption and still trust in the judicial process? Yes, Trump lets another off the hook while supposedly draining the swamp. Sad!